Samsung Galaxy Core 2 is a compact yet functional mobile phone that delivers a seamless performance. If you are interested in buying the Galaxy Core 2 online, here we come up with a quick review of the handset for you to decide and buy this smartphone at lowest online price. Check Samsung Galaxy Core 2 price in India if you are looking for a mid-range smartphone which comes with a mix of affordability with quality. The primary camera unit of the Galaxy Core 2 is a 5 MP one that is coupled with auto focus and LED flash for enhanced low light performance. The secondary camera is a VGA front-facing snapper that can make basic video calls. The Samsung Core 2 mobile phone features Android KitKat 4.4 that makes multitasking quite easy. It is powered by a Quad core 1.2 GHz processor and its 4.5" display offers an optimal environment for you to enjoy movies and games. This processor gets teamed up with 768 MB of RAM for multi-tasking and switching between applications so that you can access, open, open and load multiple applications simultaneously. There is a micro SD card slot that can support expandable memory cards up to 64 GB. Samsung Galaxy Core 2It has a 3.5 mm radio jack on the top and a multipurpose USB port on the bottom, so you can groove to your favorite tunes by plugging in your earphones. Connectivity options on the smartphone include Wi-Fi b/g/n, Bluetooth 4.0, Micro-USB and 3G. The Samsung Galaxy Core 2 is powered by a 2000 mAh battery. There are many Samsung Galaxy Core 2 specifications that enrich your experience while interacting with it. 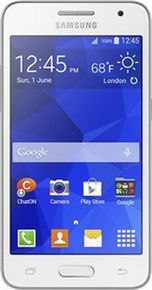 If you are planning to buy online Samsung Galaxy Core 2 then you can compare lowest online prices from various stores like Snapdeal, Flipkart, Amazon, Shopclues and many more and find the best online price for Samsung Galaxy Core 2 in India. Internal memory for use 500 MB Min.. I tell u that thus phone is really bad problem in everything.